Two of our popular restorative dental services include crowns and bridges, as we endeavour to help you achieve a stronger, beautiful, and more functional smile. All of our restorative appliances are made using safe, trusted, and durable materials, leaving you with a crown or bridge that you’ll absolutely love. Trauma, decay or the need for root canal treatment may severely weaken a tooth, however this is where a crown can come to the rescue. A crown is a tooth-shaped ‘cap’ that fits over the existing tooth structure and replaces the missing natural crown structure, helping to both strengthen and save it. Crowns are usually made of either porcelain or porcelain fused to gold, whilst being made to match the colour of your natural teeth for a seamless smile. 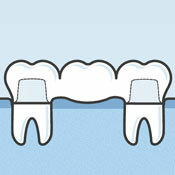 Dental bridges are quite different to crowns, as their aim is to replace a single or several missing teeth. The bridge is actually secured by crowns which are attached to the healthy natural teeth on either side of the missing tooth (or teeth). When a tooth is lost through trauma or cannot be saved by root canal treatment, a bridge is one of the possible solutions. This procedure allows our dentists to successfully restore the function and aesthetic of a patient’s smile, giving them plenty of reasons to feel confident once again. 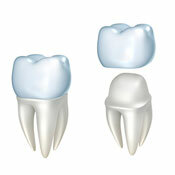 Want to find out more information regarding our high-quality crowns and bridges? Please contact KR Dental today to schedule an appointment with our friendly and experienced team!